Starting at the bottom there is one variable 250 pF capacitor and a 24 pin rotary dial to individually pick an array of 7 coils. A six pole double throw switch is used to isolate IC chips. The next switch is to control part of the regenerative process of the main tube. And the last switch is to control AM-FM frequencies and Short Wave. Above this space is a clear 4 inch plastic cylinder. 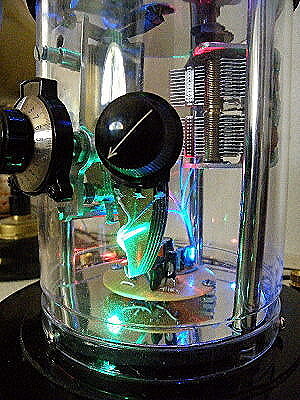 This cylinder has one 270 pF variable capacitor, which is for the antenna trim, and two 270 pF variable capacitors for station frequency tuning. 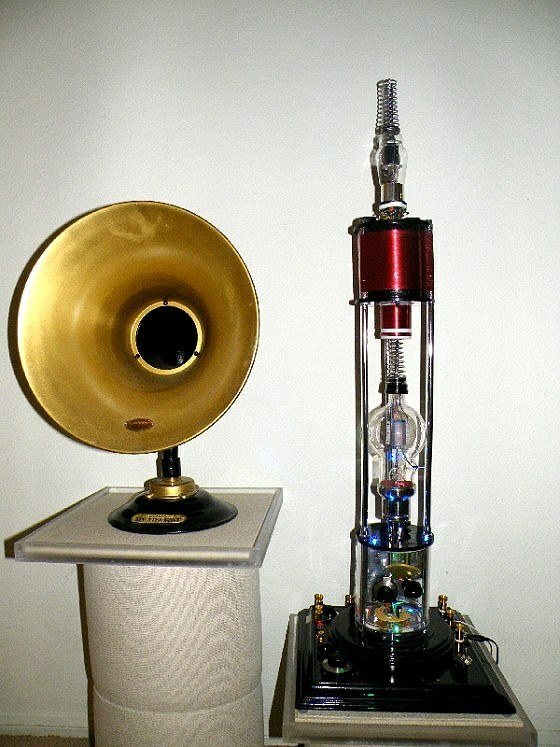 The last component is a 50k variable pot for volume control. 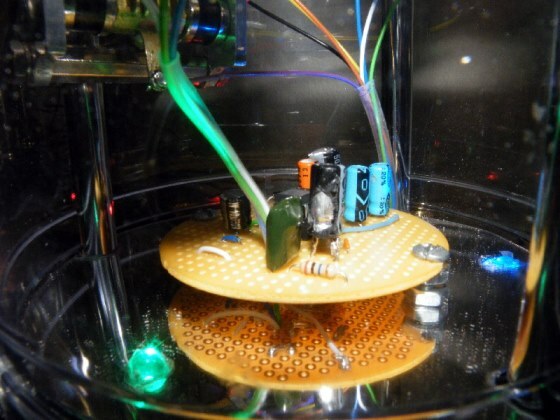 At the base of the cylinder is a circuit board housing Mike’s 386 audio amplifier circuitry. Above this array is a large transmission tube, illuminated for artistic sculpture effect. 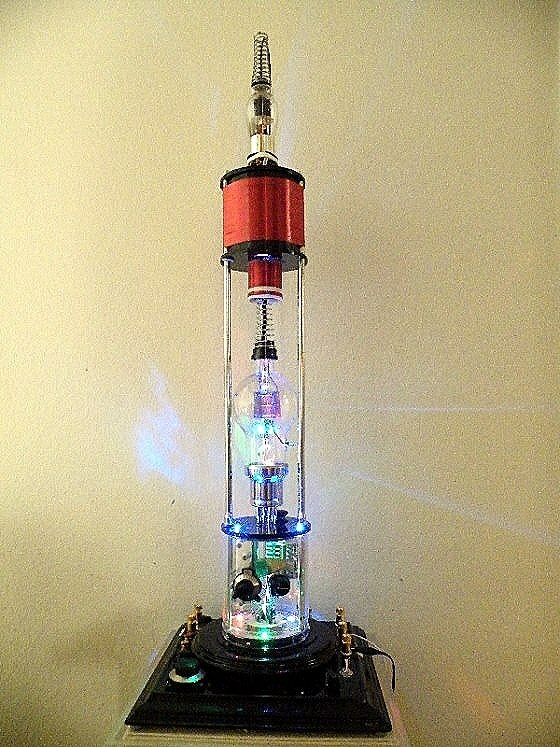 Above this tube is a small 2 inch coil with 65 turns of #24 gauge wire, and 8 turns for the tickler coil. Above this is a large 4 inch coil, 200 foot of #24 gauge wire with splices every quarter inch. 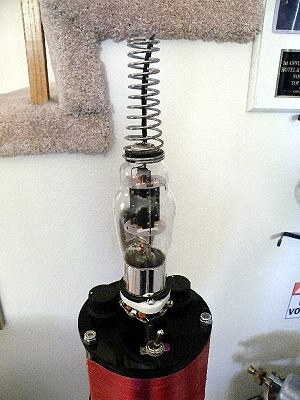 The very top tube is a 1625 12volt radio receiver tube. There are also two regenerative 50k pots and two band selector switches. The overall height of this sculpture is 38 inches. I made a short video showing this radio in action.